Home selling in the fall doesn’t have to be hard. The real estate market tends to cool down in the fall, but that doesn’t mean you have to wait until spring to list your home. This summer Ann Arbor had one of its hottest markets and that energy has found its way to fall with homes being sold within days of being on the market. 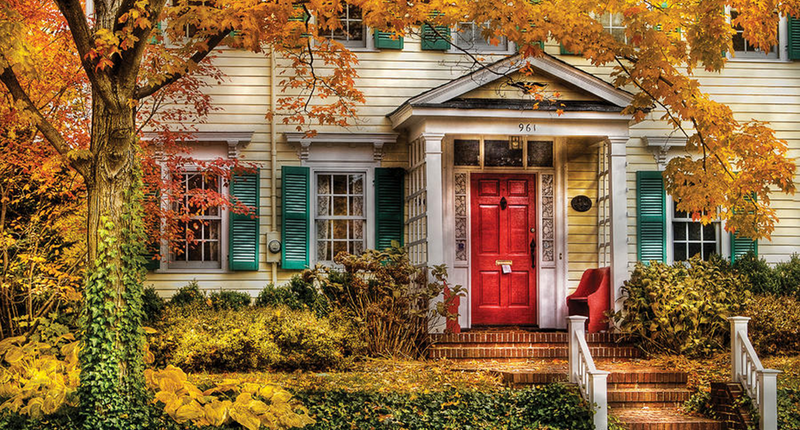 So what can you do to successfully sell your house in the fall? Growing up we have all heard “don’t judge a book by its cover,” but when it comes to real estate the first impression you home makes can be the deciding factor for potential buyers. Rake your leaves. Potential buyers want to see what the yard looks like, not a sea of dead leaves. Continue to mow your yard so it looks neat. Make sure your driveway, sidewalk, porch, etc. are also clear of leaves, debris, etc. Take a look at your trees and pull down any dead branches before they fall down from a strong wind. Clear your gutters of leaves, fallen branches, etc. potential buyers do not want to see leaf dams near the down spouts on your house. In addition to maintaining your yard, decorate the outside of your home to play into the fall season. Place pumpkins (or jack-o-lanterns depending on the time) on your porch. You can also use hay bales, fall seasonal flowers or a fall wreath on your front door to decorate the outside of your home. Again the first impression you can make with your potential buyers is an important one, so make sure it’s positive. That being said, don’t go overboard with the decorations to the point that they detract from the beauty of your home. Pick a couple of fall pieces that complement each other and you can make your home standout this fall. Selling in the fall needs more focus then just keeping a well maintained outside though. After wining potential buyers over with the outside of your home, you need to continue impressing them inside. Check your furnace. It may have been several months since you’ve last used it. Make sure it works and insert a new air filter to make your home smell fresh. This also goes for your fireplace. Clean out any cobwebs that may have formed and make it ready to use incase potential buyers want to try it out. Invest in a festive welcome mat for potential buyers to wipe off mud, water, snow, etc. before walking through your staged home. Keep your home at a warm temperature. Buyers are coming in from the cold and want to feel comfortable the minute they walk through the door. As with the outside of your home, you can also decorate the inside to capitalize on the fall season. Think about using scented candles or a wax melter to have your house smell of pumpkin pie, cinnamon, or caramel. Spice up your living room by adding red, orange, or yellow pillows to breathe life into your couch or create a festive centerpiece (ex. gourds, flowers, pumpkins) to place on your dining room table. In conclusion, you may read online or hear from your peers that selling a home in the fall can be tough, but it doesn’t have to be. Embrace the holiday season and decorate your home to create a warm, cozy setting that potential buyers can see themselves relaxing in. Before you put your home on the market though, a key factor on the success of selling your home in the fall is entering the market at the right price. With Ann Arbor’s unique real estate market it is important to talk to an experienced realtor before selling your home. Our team knows everything there is to know about Ann Arbor and are ready to help your put your home on the market today.